Meal prep subscriptions seem to be all the rage these days. Blue Apron, Hello Fresh, Sun Basket. While these monthly deliveries seem like a lot of fun for the Food Network obsessed, we found something even better. Snack subscriptions! But not just any snack subscription qualifies as a food adventure. No, no, no. 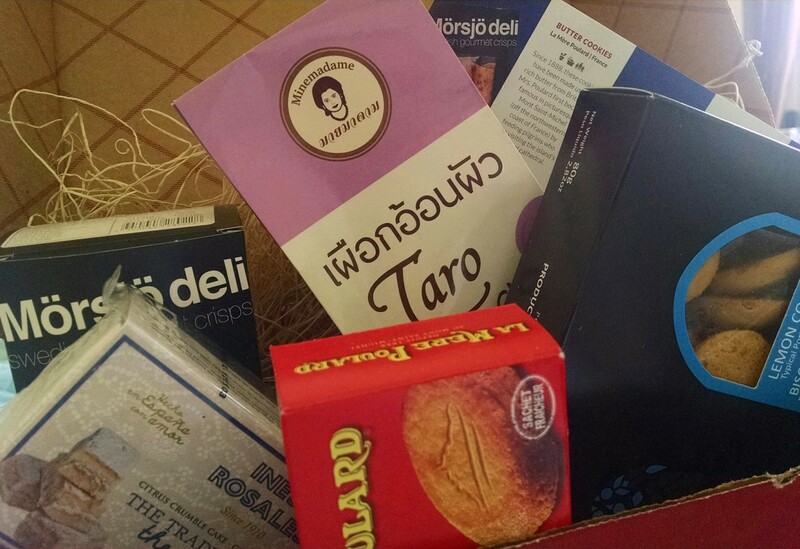 One snack box stands out above the rest, because it takes you on a trip around the world. Try the World has created a snack box delivery that contains five all-natural, non-gmo treats from five different countries each month. We love this idea for three reasons. One: It comes right to your door, saving you thousands on hotel and airfare. Two: It requires absolutely zero cooking (we can’t stress the importance of this enough). 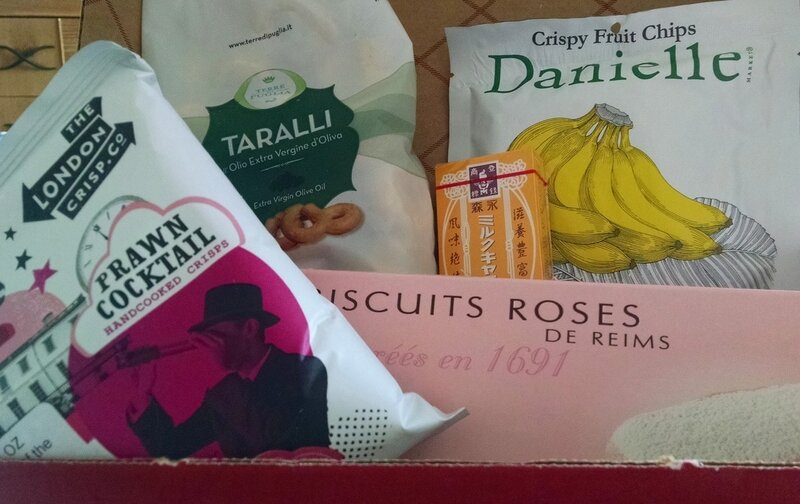 Three: In terms of experiencing different cultures, a snack box is like the equivalent of asking your concierge to recommend a restaurant where the locals hang out. Sure, anyone can whip up a batch of Thai noodles if you want to feel a connection to Thailand, but what are the regular folks there walking around eating? Thai snacks, of course! We tried Try the World for two months and received $5 off. It was a tiny bit on the pricey side, but not enough to make us shy away. $15 a month was totally worth it. Here’s what we received. Verdict: Each box had a great balance between sweet and savory snacks and came with a description card detailing where the snacks came from, why they were included, or a bit of the company’s or country’s history. We had almost as much fun reading the packaging as we did eating the snacks (almost). The Prawn Cocktail Crisps and the Pink Champagne Biscuits were highlights and we couldn’t get enough of the Flatbread or Caramels. Every snack was packed with flavor, which was a stark contrast to our bland-by-comparison American snacks. So, will we continue our subscription? Yes we will! Have you ever been sitting down to lunch and thought, You know what would make this better? If this sandwich was tinier and cut into triangles. And if it was joined by other tiny sandwiches. And tiny desserts. And scones. And if it was served on a three-tiered tray. With tea. And if it was later in the day. Like, say 4pm. And if I was eating with friends. And we were overlooking the Pacific Ocean. I mean, we’ve all been there, right? Which is exactly why Afternoon Tea was invented (historical fact). Mealtime can be monotonous, so why not stir in a little adventure! There are many, many Afternoon Tea venues across the country and around the world that are worth visiting (we have a bucket list just for tea spots), and each comes with its own charms. As we’ve found while conducting extensive research on the subject, sometimes you can even find afternoon tea served in a place you wouldn’t expect or a place that doesn’t exactly advertise the fact, giving it a hint of mystery and exclusivity. One such spot is the Belmond El Encanto, a luxury hotel located in the Santa Barbara Hills. Let’s just say, Santa Barbara hasn’t earned the nickname “The American Riviera” for nothing. It will probably be a sunny 72 as you zip past the Santa Barbara Mission and wind your way up to the hotel. You’ll be surrounded by trees and sweet-smelling flora as birds chirp in the distance. Once you arrive, a handsome valet will whisk your car away while another holds open the lobby door and hopes you have a wonderful day. Feeling pampered yet? The best moment of your tea experience at the Belmond will probably be when you’re brought out onto the patio. The swaying palm trees act as arms spread wide, revealing the sweeping ocean and city views just beyond the gorgeous hotel grounds. You will be struck by how peaceful it feels, how relaxed. Soft classical music will be playing in the background as you’re shown to your seats and you’ll realize you would be perfectly content just sitting there all day. But tea is waiting! The Traditional Tea comes with one classic and one currant scone accompanied by dishes of clotted cream and marmalade as well as a selection of sandwiches and sweets. Any good Afternoon Tea worth its salt will transform their tea sandwiches into works of art, as the Belmond has done with its egg salad and snipped chive, French cornichons, smoked salmon and watermelon radish, and cucumber with minted cream cheese. The desserts are equally beautiful and scrumptious (plus they have touches of edible gold). 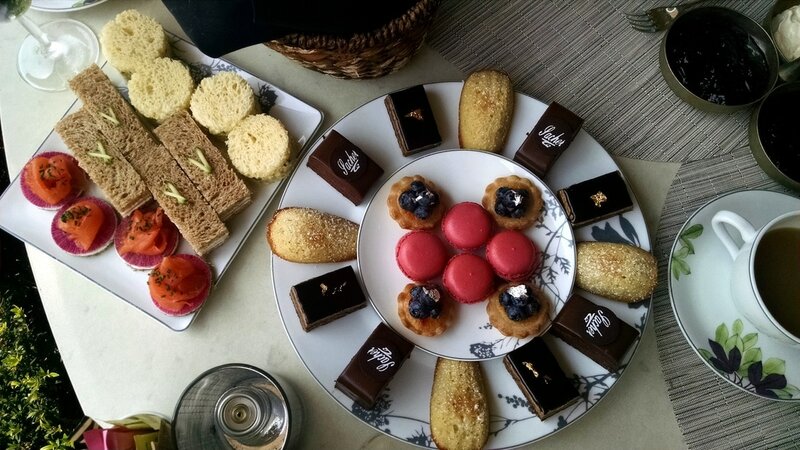 Macarons, chocolate and coffee infused Opera cake, an almond berry tart, chocolate and apricot Sacher torte, and citrus madeleines. You will be so full you almost won’t have room for tea. Just kidding, there’s always room for tea! We recommend the house blend or the blooming jasmine (that one comes with a show). 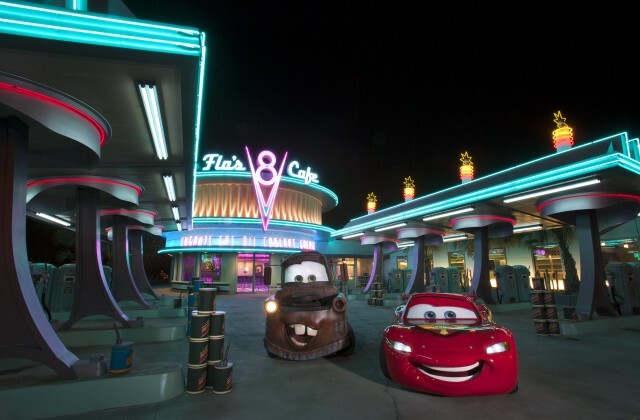 We promise we do actually eat food that hasn’t been prepared by Disney-affiliated chefs. Really! But when it comes to theme, you really can’t top their particular brand of magic. Which is why, if you’re looking for a New Orleans themed experience this Mardi Gras (and can’t afford the real thing), all you have to do is pop on over to Ralph Brennan’s Jazz Kitchen in Downtown Disney, Anaheim. From the outside, Ralph Brennan’s looks is a traditional two-story, iron-balconied building one might find in the more romantic cities in Louisiana. Awnings and plants hang overhead and ornate iron gates beckon you to enter. 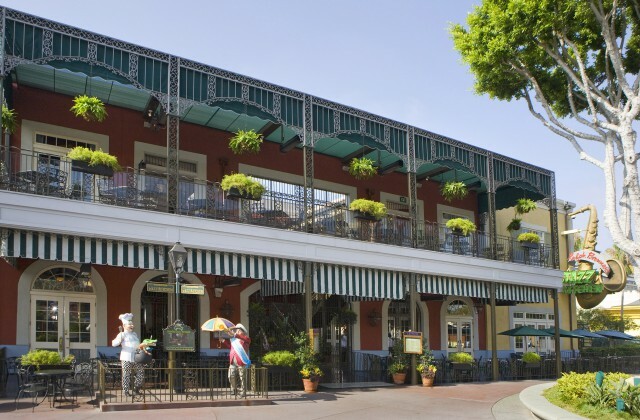 Once inside, you are no longer in the hustle and bustle of a Disney thoroughfare, you’re enveloped by the romance of the French Quarter. A tiled courtyard, a grand staircase, a multi-tiered fountain. If only there were music playing… Oh wait, what’s that coming from the next room? Under a canopy of colorful parasols and shimmering beads sits a stage, flanked by columns and surrounded by tables. A warm glow emanates from the low platform as a man sits behind a grand piano, serenading diners enjoying Sunday brunch. But once night falls, the tranquility of day gives way to the energy of Bourbon Street with festive jazz, New Orleans R&B, and zydeco. Not only does the Jazz Kitchen have their ambience down pat, but it’s got roots too. Ralph Brennan’s family first went into business in 1943 when they purchased the Old Absinthe House on Bourbon Street in New Orleans’ French Quarter. To help capture that authentic Louisiana look and feel, a dozen New Orleans-based artists were commissioned to create original artwork for this California location. And boy was it worth it! Of course, the desire for authenticity didn’t stop there. Ralph Brennan’s boasts what they call a “Parade of Crescent City Specialties”, including Gumbo Ya-Ya, Pasta Jambalaya, and Po’ Boys. You can sip on a refreshing Louisiana Lemonade or try a traditional Hurricane. And don’t forget the Beignets and Bananas Foster. The biggest problem with the menu here is that it’s nearly impossible to decide what to order! When we can’t decide, we go with the Bananas Foster French Toast or the Cajun Poutine Etouffe. We’re drooling a little just thinking about it. Other culinary highlights include the Peach Cobbler, Bread Pudding Souffle, Southern Fried Chicken, Blackened Shrimp Street Tacos, Popcorn Calamari, Boudin Balls, and Catfish. Prices range from $12-16 for lunch and $22-36 for dinner and you’ll definitely need to make a reservation at least 24 hours in advance if you plan to have brunch. November is the magical month when Disneyland transforms from a spooky Halloween wonderland to a sparkling, festive ode to all things Christmas. You have to be a real Grinch not to fall in love with the pageantry and creativity. We’re not judging, but if Disneyland isn’t an Adventure you’re on board with, you may need to reevaluate your priorities. Also, we may not be able to be friends and that would be tragic. Magic is a mainstay of Adventure and the talented Disney chefs and bakers that create the much-anticipated holiday menus have it in spades. 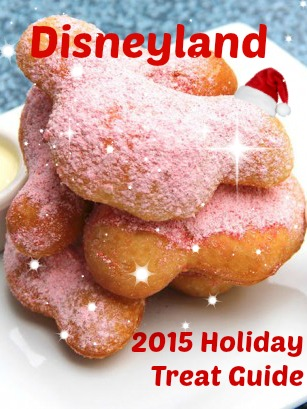 Disneyland may be a Class A Adventure all on its own, but their special holiday treats take it to another level of joy altogether. To pass them up means that either a)you’re one of those people that takes pride in saying no to birthday cake or b)you are overwhelmed by all of the tasty choices and need our help to guide you. Well fear not, dear readers! We have tackled the positively grueling task of compiling a list of must-eat holiday treats, thus creating a mini adventure within an adventure (a theme-within-a-theme, if you will) just for you. Consider this your early Christmas present.